Posted August 2nd, 2018 by Ashley Lee. Changing jobs regularly, whether it’s yearly, bi-yearly, or whatever, is not all that uncommon these days. The question is, why? Does it have anything to do with employee engagement? Back when I was just entering the work force—fifteen years ago exactly—securing a long-term job with a company was the ultimate goal. It wasn’t down to an exact science mind you, but the mentality was such that many young professionals sought out a career in a company they felt content with and stuck to it for as long as they could. This, of course, was not the path for everyone, but it certainly appeared to be the norm for many of us. Perhaps part of this mentality came from the advice and perspective of our parents and mentors of the Baby Boomer generation. The idea of unrelenting loyalty, even in times of adversity, is a strong message the older generation graciously bestows upon us everyday. As the years have passed however, it appears this view of longevity has deteriorated. Call it what you will, but the mentality of staying with one company for years or decades at a time has shifted. The trend we are now seeing is one of job bouncing: spending a year or two at one company then moving to another and another and another. Whether this is due to boredom, discontent, or even a need to expand knowledge through multiple experiences, it’s definitely a trend that can prove to be difficult for company culture, business development, and even job security. © Flickr user Andreas Kollmorgen. The website Snacknation brings to light numbers that show just how clearly the workforce is losing employee engagement. According to a published chart representing employee engagement in the US, only 29% of the workforce is engaged in their jobs. 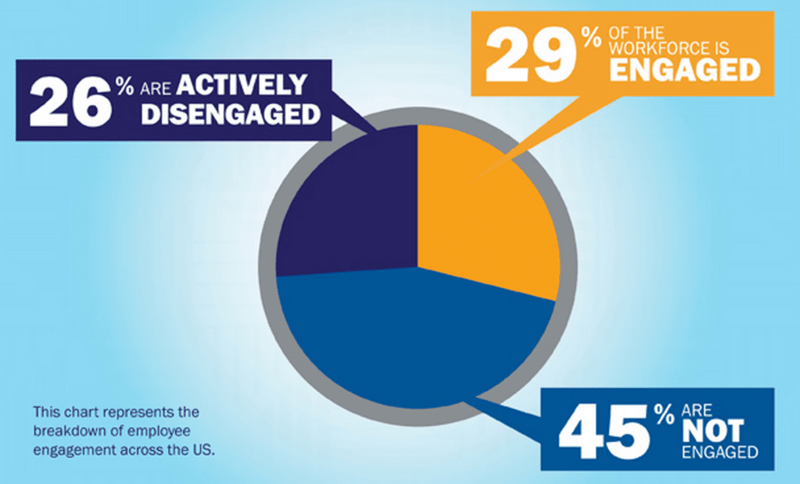 45% of people are disengaged in their jobs and a staggering 26% of people are actively disengaged! Given these percentages, perhaps it is time for companies to brainstorm on ways to engage their employees; particularly those who have a high turn-around rate. Looking as these ideas, it’s easy to see how generalized they are. What does it mean to “give your people ‘insider’ information?” Or what constitutes “Having more fun at work?” You can interpret these suggestions for hours and brood over what to do with them for weeks or even years. Rather, take these ideas as a way to begin the conversation with your employees. As a company, you need to investigate each suggestion and formulate a plan based on what works for your business as a whole. After all, every company culture is different and while you may or may not need to boost employee engagement, it’s always wise to stay on top of ways to foster contentment throughout the office. If you have a handle on how employees are feeling in their jobs, you have a greater chance for successful job retention. Chances are, if your employees don’t feel well trained for their jobs, they didn’t receive adequate training from Day 1. Find out where the perceived training gaps lie and then address them quickly, especially if training is a common concern among your team. An employee who’s looking for a more receptive ear from management has likely shared feedback within your organization, but didn’t feel that his or her input was acknowledged or well-received. Another possible scenario: Management solicited feedback from employees but never acted upon it. If your employees are feeling overwhelmed and unproductive, it’s time to take a closer look at these issues. Make sure that, when possible, your organization is transparent on issues around wages. Consider if your benefits are competitive with others in the industry. What intangible benefits (such as flexible scheduling, high employee retention rates, or efforts to show real appreciation) do you offer? Consider these factors and make sure they’re communicated with your employees. Is one bad apple ruining the entire team? The impact of poor management can be toxic to an organization. Any point of concern about management — whether you think the employee is a squeaky wheel or not — deserves your attention. As with any challenge, a critical early step is to dig and really try to understand what’s happening. If you want employees to stick around (and why wouldn’t you?) then you must truly discover what causes them to leave—and what would inspire them to stay. Previously: How Urgent Is It?